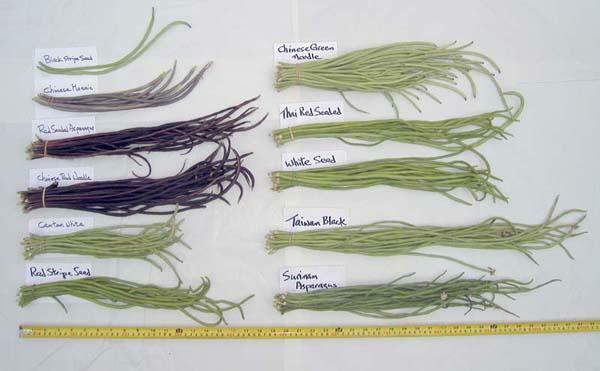 We compared 12 varieties of long beans, Vigna unguiculata, to determine which ones have the best production and the best flavor for growing here in Santa Clara County. Chinese Green Noodle was the most productive variety by far and was the favorite in the first tasting for its very tender, mild pods. Chinese Red Noodle was a favorite for those who like beans with a richer flavor and a firmer texture and was a good producer. All activities were conducted at out Nine Palms growing facility. The plot had previously been used for a raspberry trial. 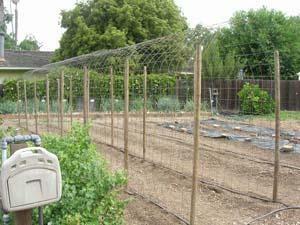 In May we finished removing the raspberries and rototilled in four inches of compost. We created an arbor structure for the beans to climb by bending 16-foot lengths of five-foot wide concrete reinforcing wire into an arch and lashing them to eight-foot posts that had been driven one and one-half feet into the ground. The arch is 4 feet wide, 7 feet high in the center, and 35 feet long. The one-foot wide planting beds are mounded slightly, about six inches higher than the center of the pathway. The concrete reinforcing wire has a 6-inch mesh. We planted the beans directly into the ground on June 1, two beans per hole, six inches apart, and thinned them after two weeks to one seedling every six inches. There were eight vines of each variety, four vines on each side of the arbor so they could grow up to the center and meet. There was a one-foot gap between varieties. Irrigation was set to 45 minutes, three times a week. Harvesting began on August 7 with Chinese Mosaic and Chinese Green Noodle. Our last harvest was September 28, and the vines were removed on October 2. The biggest producer, by far, was Chinese Green Noodle, followed by Chinese Mosaic and Chinese Red Noodle. 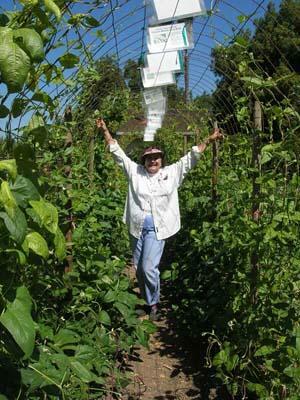 Long beans mature quickly and need to be picked every few days so they don’t become over mature and tough. In general, they should be picked while still slender, before they get puffy and the seeds become visible. Thai Red Seeded and White Seed were two varieties that could be allowed to get a little fatter and meatier than the others while still remaining tender. We harvested through Sept 28, although at that point most varieties were producing a few ounces or less. Only Canton White Pod (10 oz) and Thai Red Seeded (13 oz) were still producing more than minimal amounts that final day. We conducted two tastings. The first one was on Aug 24 with the five varieties that were producing at the time (Chinese Green Noodle, Chinese Mosaic, Chinese Red Noodle, Red-Seeded Asparagus, and Thai Red-Seeded). The second tasting was on September 18, with all varieties except Kaoshiung, which only produced one pod at the very end. For both events, Jean individually stir-fried samples of each of the varieties in a hot wok with oil, a little salt, and some water to steam. People were welcome to taste the beans raw as well if they wanted to. Chinese Red Noodle 7 4 Rich, deep flavors, chewy. But some people disliked the firmer texture, calling it tough. Thai Red Seeded 0 2 Heavy flavor, not as sweet as others, very tasty, sweet, meaty. Can be picked at a larger diameter, resulting in sweeter, meatier beans. Ants were present on the vines and flowers. 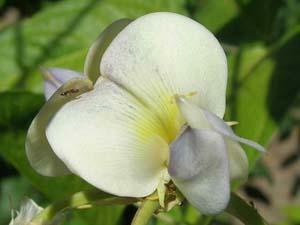 They did not appear to be causing any damage but were merely visiting the extrafloral nectaries present on the flowers. Red Stripe Seed, White Seed, and Kaoshiung varieties showed signs of bean mosaic virus from the start, so I suspect the seed was infected. We didn’t do anything, although in retrospect perhaps we should have taken out the infected vines so the virus wouldn’t be spread to any others. 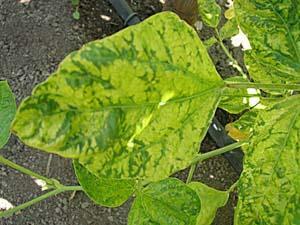 We didn’t save seed from any of the varieties due to the presence of the virus in the plot. Chinese Green Noodle was the most productive variety by far and was the favorite in the first tasting for its very tender, mild pods. 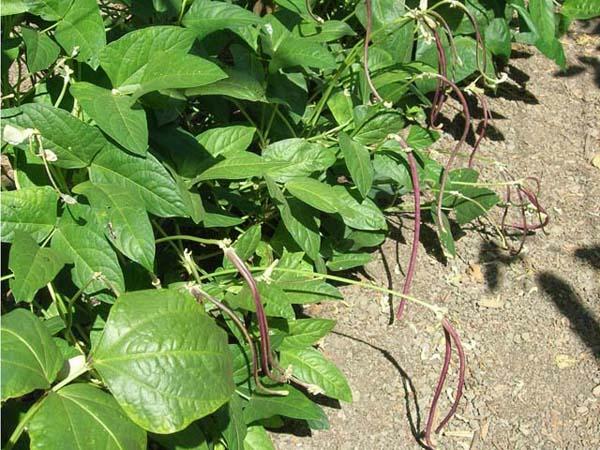 Chinese Red Noodle was a favorite for those who like beans with a richer flavor and a firmer texture and was a good producer. Black Stripe Seed was rated highly for flavor but was a poor producer.